On December 10, 1925, the Bavarian State Ministry of the Interior granted the municipality of Oberschleißheim the right to bear a coat of arms. In those days, this right was only granted to municipalities that held the official status of city or market town, or to those of particular historical significance. The design was carried out by Professor Otto Hupp. Before, in a session of the municipal council on February 12, 1925, the introduction of a coat of arms was decided on. In the same session, the municipal councilors opted for contacting Professor Otto Hupp in regards to the design. 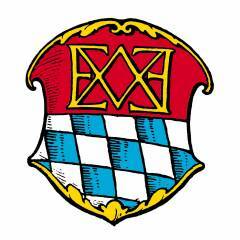 This versatile artist, an Oberschleißheim resident since 1882, is one of Germany’s most eminent heraldists. The coat of arms consists of a divided shield. The upper part shows the golden monogram of Elector Max Emanuel on a red background. The lower part contains the Bavarian lozenges. The white and blue lozenges, also known as fusils in heraldry, refer to the centuries-long linkage Oberschleißheim has with the House of Wittelsbach, especially since the end of the 16th century when Duke Wilhelm V retired to Oberschleißheim and built a manor and several hermitages there. In memory of Max Emanuel (1679-1726), his monogram was integrated into Oberschleißheim’s coat of arms. The Elector commissioned Lustheim Palace in 1684/89 and, as from 1701, the New Schleissheim Palace. The monogram, whose design continues the tradition of earlier examples, shows the entwined initials of ELECTOR MAX EMANUEL. Among other places, the monogram can be found in the New Palace on the ceiling of the Braunes Kabinett (brown cabinet), also called Niederländisches Malerei-Kabinett (Dutch art cabinet).